Mining giant BHP Billiton expects some interruption to its Australian iron ore exports after a nearly 3-km-long train loaded with the commodity was forcibly derailed this week after running away en route to a key shipping hub. BHP said in a statement on Wednesday that its reserves of the steelmaking ingredient at the Port Hedland hub were not expected to cover the entire period of disruption following the incident, and that it would be liaising with its customers about its contractual commitments over that time. One of BHP’s customers in China, a steel producer, has, however, not yet received any notice from the miner. “We have a long-term contract with BHP and we haven’t received a notification so far,” said an official at the mill in southern China who declined to be named as he was not authorized to speak to media. BHP did not immediately respond to a Reuters query on whether it expects to declare a force majeure on shipments. Force majeure means a buyer or seller cannot fulfill contractual obligations because of outside forces. Analysts expect BHP to be able to claw back any shipment delays and the impact to operations to be insignificant. There has been no disruption so far to shipments of BHP’s medium-grade iron ore cargoes to top market China, traders said. Prices of iron ore futures in both China and in Singapore were lower on Wednesday. “I don’t think any disruption would matter as demand is now focused on low-grade iron ore,” said an iron ore trader in the city-state of Singapore. Australia’s Transport Safety Bureau said on Monday that a probe into the derailment was underway. It is expected to release a report in the second quarter of 2019. The derailment came after the train ran away at high speed for nearly 100 km (62 miles) when the driver left the cabin for an inspection. Nobody was injured in the incident that happened in a remote area around 120 km south of the world’s largest iron ore loading terminal in the country’s northwest. The miner said its normal train operations remain suspended, estimating that around 1.5 km of train track were damaged. BHP’s mine sites continue to operate and it expects a partial resumption of rail operations in about a week. 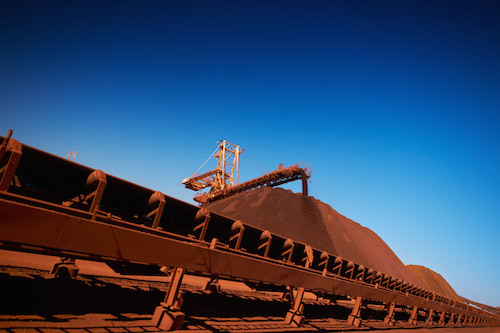 “Investors are keeping one eye on the developments in the Pilbara after BHP announced it had halted all rail operations,” ANZ bank said in a report. Footage aired by a local television station showed a wrecked locomotive beside a chain of upturned wagons in the country’s Outback bushland. BHP expects the wreckage to be removed over the next few days with track repairs starting around the same time. “Recovery operations are underway. We cannot speculate on the outcome of the investigation,” BHP said.